These chicken nugget look-a-likes (which by the way are much healthier) are great for parties as well as for kids. So make sure to include them to your New Years' party menu. 1.Preheat oven to 375 degrees. Line a baking sheet with parchment paper and fit with a wire rack. Spray with cooking spray; set aside. 2.Place flour in a large bowl and season very generously with salt and pepper. Whisk eggs in another large bowl with 2 tablespoons water until well combined. Place the breadcrumbs in a third large bowl, and drizzle with olive oil; toss to coat. Stir in cheese and cayenne and mix well. 3.Place chicken pieces in the seasoned flour and toss to coat. Working in 3 batches, shake off any excess flour from chicken pieces and transfer to egg mixture; stir to combine. 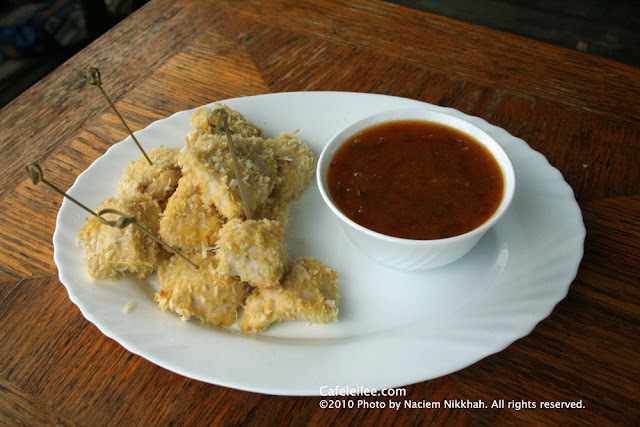 Transfer coated chicken pieces with a slotted spoon to the breadcrumb mixture and toss until completely coated. Place the breaded chicken pieces on a rack-lined baking sheet, spacing them evenly apart. Repeat process until all the chicken is breaded. Bake until golden brown and chicken is cooked through, 18 to 20 minutes. 4.In a small bowl, stir the apricot jam, mustard, and thyme together until combined. Allow chicken to cool 10 minutes before serving with apricot mustard mixture. فر را روی درجه ۳۷۵ فارنهایت یا ۱۹۰ درجه سانتیگراد روشن کنید تا گرم شود. یک سینی فر به نسبت بزرگی را با فویل بپوشانید و کمی با روغن مایه چرب کنید. آرد را در یک بشقاب گود بریزید و با نمک و فلفل مخلوط کنید. در بشقاب گود دیگری تخم مرغ ها را با دو قاشق غذاخوری آب خوب بزنید. آرد سوخاری را در بشقاب گود سوم بریزید و با روغن زیتون مخلوط کنید. سپس پنیر پارمزان رنده شده را همراه با فلفل قرمز به آرد سوخاری اضافه کنید و خوب مخلوط کنید. تکه های مرغ را اول در آرد بغلتانید، بعد توی تخم مرغ و بعد با مخلوط آرد سوخاری آغشته کنید و در سینی فر به فاصله کم قرار دهید. این مراحل را برای همه تکه مرغ ها تکرار کنید. سینی را توی فر به مدت ۲۰ تا ۲۵ دقیقه بگذارد تا مرغ ها پخته و کمی برشته شوند. توی یک کاسه مربا هلو یا زرد الو له شده را با خردل و آویشن مخلوط کنید. مرغ ها را بگذارد برای حدود ۱۰ دقیقه کمی خنک شوند سپس با سس مربا و خردل سرو کنید. What a great little appetizer. I'm always looking for relatively healthy things to serve to my guests without losing all the flavor and this is so easy. Thank you for your adaptation!